Confessions of a 20-something Scrapbooking Mother: What do you guys think?? Wow, 2 posts in 1 day! I was just wondering what you guys thought about this? I thought it might be helpful to get Aaron semi-introduced to a baby. So I bought him a doll today. I also bought a boy outfit for the doll! 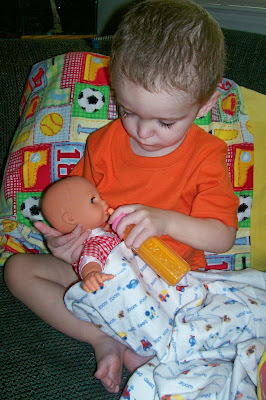 :) But I thought we could teach him some things with the doll before the baby gets here. You know, things like don't poke the baby in the eye, don't hit the baby, don't put the baby in the toilet. Lol. These are the things that Aaron will need to learn! :) My husband however, is having a cow that I bought our son a doll. The first thing Aaron did when I gave it to him was give him his bottle. It was so sweet! So, what do you think? Hiya Becky! Hope you and baby Alex are doing good! I did the same thing with my daughter when I was expecting our second baby and it was really helpful! She even brought her baby to the hospital to meet the new baby when it was born. It's a great idea! Aaron looks like he will be a great big brother. I think it's a FABULOUS idea! Absolutely wonderful. Boys and men also have the "caregiver" heart. Let hubby know his son's heart is tender, loving and wants to "help".